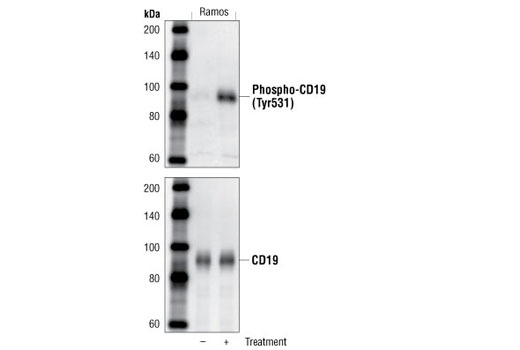 Phospho-CD19 (Tyr531) Antibody detects endogenous levels of CD19 only when phosphorylated at tyrosine 531. Polyclonal antibodies are produced by immunizing animals with a synthetic phosphopeptide corresponding to residues around Tyr531 of human CD19. Antibodies are purified by protein A and peptide affinity chromatography. CD19 is a 95 kDa coreceptor, which amplifies the signaling cascade in B cells (1). On the B cell surface, CD19 associates with CD21, CD81 and Leu-13 to exert its function. The cytoplasmic tail of CD19 has nine conserved tyrosine residues playing critical roles in CD19 mediated function by coupling signaling molecules to the receptor (1). After B cell receptor or CD19 ligation, Tyr531 and Tyr500 of CD19 are progressively phosphorylated. This phosphorylation enables the coupling of PI3 kinase and Src family tyrosine kinase to CD19 and activates the PI3K and Src signaling pathways (2,3). Coligation of B cell receptor and CD19 also promotes Tyr409 phosphorylation in CD19. The phosphorylation at these sites enables its binding to Vav and mediates elevated intracellular calcium response, as well as the JNK pathway (4,5). O'Rourke, L.M. et al. (1998) Immunity 8, 635-45. Sato, S. et al. (1997) Proc Natl Acad Sci U S A 94, 13158-62.